Revival Developers Ltd. was tasked with undertaking the construction of a new showroom on the outskirts of Cheltenham for Cotswold BMW. This will be the largest BMW dealership in the UK which, when completed later in 2017, will have over 190,000 square feet of sales area and showrooms over three floors along with 48 service bays. We were called into work alongside Revival Developers to insulate 1,100 square meters of metal decking, sections of which were on all three levels. The building had to achieve a U value of 0.16 to conform to building regs. and in addition to requiring insulation, they wished to eliminate any condensation risk. Spray foam was our client’s preferred option after considering other insulation materials as it was the most practical solution for this build, providing a continuous application with no joins so, therefore, no gaps for air leakage and meeting the required thermal efficiency of the building. The ET 150 paint which prevents moisture from being absorbed by the foam, was sprayed on top of the foam to create a long-lasting, waterproof finish. It is also class 0 compliant which means that once dry the coating has a flame resistant finish. “The service from start to finish was great. Jerry is a very honest, old school chap who just comes in and gets the job done – which is refreshing in today’s industry. Very professional from start to finish. 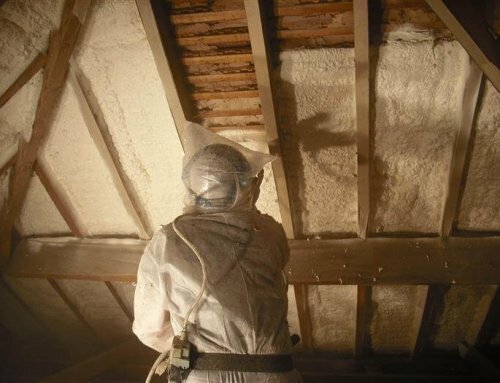 The product is a great solution for areas where you need soffit insulation within ceiling voids, it’s far quicker than boarding out with flat insulation boards.